Chicken Roll Ups make a perfect appetizer, snack or easy meal. Holy cow it’s finally February! 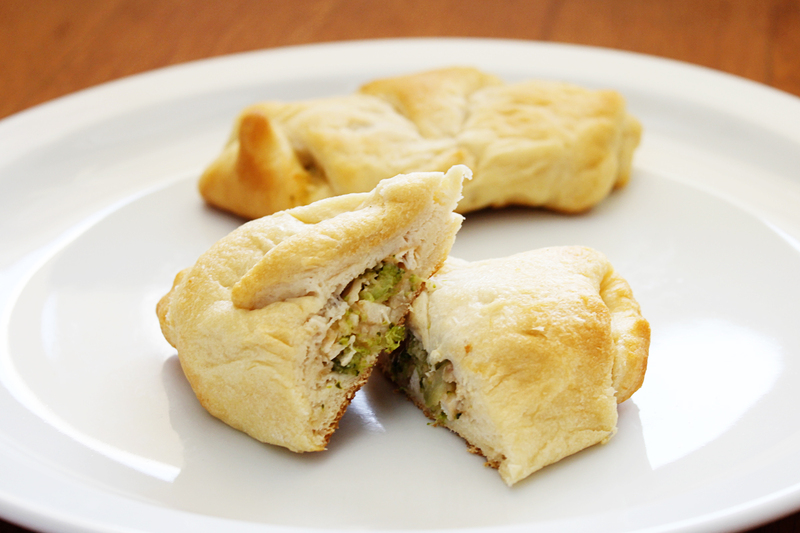 Easy, delicious and packed with chicken, broccoli and cheese flavors these chicken roll ups will sure to be a bit at your next game day gathering. During this time of the year I often like to make little meals/snacks that taste good but don’t require a ton of effort. Please excuse this not completely made from scratch recipe, I usually like to make it all myself, despite my husbands questions of why? Trust me, these are good and you won’t be disappointed. Whether you serve them as an appetizer, snack or with a salad for your meal, leftovers will be hard to come by. Even my 20 month old ate these right up, so I hope you’ll enjoy; happy baking! Preheat your oven according to the crescent roll instructions. In a mixing bowl combine the chicken, cheese, yogurt and cooked broccoli mixture. Roll out the dough and fill with about 1 Tbs of filling per triangle, roll them up pinching the seams to keep the filling inside. Bake for allotted time on packaging and carefully remove from the oven when they are golden brown. Serve warm. Hi Emily! Thanks for linking up at GYB and following http://www.CallMePMc.com! Love your blog, Looks great! Following now on Pinterest, Twitter and GFC. Happy Thursday and Happy New Year! Hello, and thanks for linking up on the GYB hop! I’m enjoying getting to know some new blogs, and reconnecting with ones I’ve visited before. I’m your newest Twitter follower, and I look forward to getting to know you better 🙂 These chicken roll ups look delicious! My mom makes something similar but they’re extremely time consuming since she uses pie crust, this looks like a great way to cut down how long it takes to make them. Thanks for sharing! These look yummy and easy – my kind of recipe! These would be great for football parties, teen get-togethers…. my wheels are turning! I’m here from It’s Overflowing. Thanks for sharing! They simply look delicious Emily! YUMMY! These roll ups look so good! I’m always looking for new crescent rolls recipes. These will be perfect for the big game on Sunday! I love that you used greek yogurt. It’s my fave!